How Do You Multiply a Three-Digit Number by a One-Digit Number? 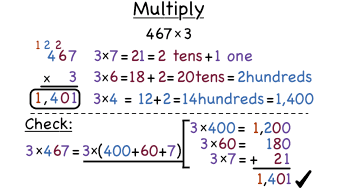 If you want to multiply a three digit number by a one digit number, it can be helpful to line up the multiplication vertically. This tutorial takes you through the process of multiplying! Recognize that in a multi-digit whole number, a digit in one place represents ten times what it represents in the place to its right. What is Place Value for Whole Numbers? Place value is a building block of numbers. Without place value, we couldn't keep all our numbers straight! This tutorial introduces place value and shows you the parts of a place value chart. How Do You Write a Whole Number Given in Standard Form in Expanded Form and in Words? If you have a number in standard form, you can quickly change it into expanded form or even into words with a few steps! Watch this tutorial to learn the steps needed to change from one form to another. How Do You Add Whole Numbers? To add numbers, you can line up the numbers vertically and then add the matching places together. This tutorial shows you how to add numbers vertically! How Do You Multiply a Two-Digit Number by a Two-Digit Number? When you're multiplying a two digit number by a two digit number, it's important to keep the places lined up correctly. This tutorial helps you practice multiplying while keeping everything organized!